The recent two-night Vijay Iyer mini-festival, dubbed “The Sound of Surprise,” covered what Walker Art Center curator Philip Bither described as a “curious diversity” of the wide-ranging projects of the creative pianist. Iyer, whose work of the past fifteen+ years has garnered critical praise, Grammy nominations, and certainly, the “sounds of surprise,” embodies that “curious diversity” in his projects and in his physical being. His doctoral research at UC-Berkeley addressed musical cognition, an area of study usually limited to physicists and neurologists with interests in music, rather than musicians with interests in physics and neuroscience. But to Iyer, it makes perfect sense to consider music in the context of bodily experience. “The body is in the musical space, interacting with the instruments,” says Iyer. And over two nights on the stage of the McGuire Theater, he brought us not only the “Sound of Surprise,” but literally the surprise of sound, a showcase of man and machine, the art and physics of music. Over two nights, Vijay Iyer was as much a part of the piano as of the ensemble. 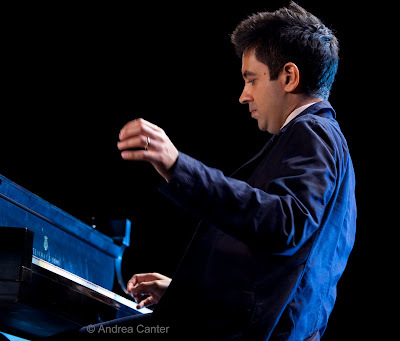 And in turn, the piano was an extension of Vijay Iyer. The program presented Iyer in five contexts over six sets across two evenings—two solo sets as centerpiece each night, book-ended by duos and trios, covering a new pairing (duet with trumpeter Wadada Leo Smith) and a long-running duo (with poet/spoken word artist Mike Ladd), a post-bop focused trio (with Steve Crump and Marcus Gilmore), and a fusion of Indian tradition and jazz idioms (Tirtha with Nitin Mitta and Prasanna). The two-night residency is not a new concept in the Walker’s jazz programming, with a weekend devoted to the many ensembles of Dave King in 2010. But the breadth of musical concepts covered by Iyer in six sets truly left the listener breathless. Happily. For me, most happily was the experience of Vijay’s two solo sets. Watching, as well as listening, to two sets of solo Vijay and one wishes there was a stop-action/slow-speed video of the pianist’s hands. Are those hands and fingers extensions of the keys or vice versa? I had a direct view of the keyboard from the fourth row and it was one of my most visually as well as aurally engaging jazz experiences. Iyer creates space in a flurry of notes, sound in the near absence of physical contact, summoning melody or cacophony with a wave of his hand like a magician. With his fingers he grabs, pulls, pushes, twists, slides, massages, jabs, hammers, plucks, abd strokes the keys like a veteran percussionist melding with the drumkit. Yes, the piano is a percussion instrument, an orchestra, a magical circus, and Vijay is the drummer, conductor, and lion tamer. The first night set mostly featured his original compositions, while the second night set was entirely “standards,” giving the audience the full resume of Iyer the musical architect, one who builds towers from the ground up as well as one who redesigns from inside out. His opening of Solo I suggested every Monk composition tossed into one stew pot, falling under the rubric of Monk’s “Work.” He followed with his own “Spellbound and Sacrosanct, Cowrie Shells and the Shimmering Sea,” more accessible than its title and at moments recalling “Round Midnight” (although perhaps “Round the Clock” would be more apt). He ended with “Autoscopy” from his much-lauded 2009 Solo, which seemed to meld the best of Cecil Taylor and Craig Taborn. Solo II opened with a percussive and playful “Somewhere,” the rhythm itself hinting at a rumble. Vijay punched out “Epistrophy” as an intimate if assertive blues, while a luxurious “Darn That Dream” carried a faint homage to stride with distinct traces of “These Foolish Things” throughout. I’m not sure why we don’t hear Ellington’s “Black and Tan Fantasy” more often, particularly in solo, but perhaps it is just too difficult for mortals. Vijay can swing hard! His “Giant Steps” was wildly inventive, while his closing “Imagine” gave the Lennon and McCartney hit a deep buzz, Iyer alone recreating the feel of a Bad Plus cover. Introducing the second night’s program, Philip Bither referred to jazz, at least in Vijay Iyer’s world, as “the sound of reaching.” Iyer is an artist who is perpetually reaching for the next idea, the next collaboration, the next sound. He always delivers surprise, and we are never bored. Full review of the Sound of Surprise will appear on Jazz Police and JazzINK, very soon.